Score on Davie’s insane $60 Checkmate Caesar might just be this holiday’s must-order cocktail. 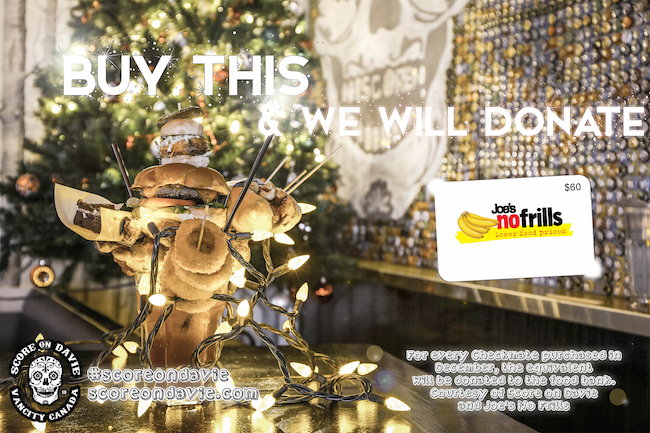 For the entire month of December, Score has teamed up withJoe Skokan of Joe’s No Frills so that for every Checkmate Caesar sold, the restaurant and grocery store will donate $60 worth of groceries to the food bank. “Score has always tried to do our part around the holidays and this year we wanted to feature the Checkmate Caesar as a way to raise more money for the food bank than ever,” Score’s owner Jesse Ritchie told Vancity Buzz. And, really, it’s quite easy to do: Basically, you can first feed your family (or friends) with the outrageous meal’s worth of garnishes of the Checkmate Caesar (that’s a full roast chicken, Score burger, slider, chicken wings, pulled pork mac and cheese hot dog, roasted vegetables, and a brownie for dessert), then help deserving families get the food they need. Since you’ll undoubtedly want to split the bill, it’s an easy way to give big without spending a lot–and you get to eat and drink! “Vancouver is an expensive city to live in and I think people would be generally surprised when they find out how many people rely on the food bank on a weekly basis,” explains Ritchie. In addition to the Christmas Checkmate donations, Ritchie says they’re rolling out the Score on Davie hot meal mobile, which will be driving around the holidays setting up free hot meals to those who want one. Ritchie says they sell at least 50 Checkmate Caesars per month, but they are eager to see that number double this month, so they and Skokan can really help out. “We know there a lot of people who need that extra nudge to try one and we hope they do!” says Ritchie.